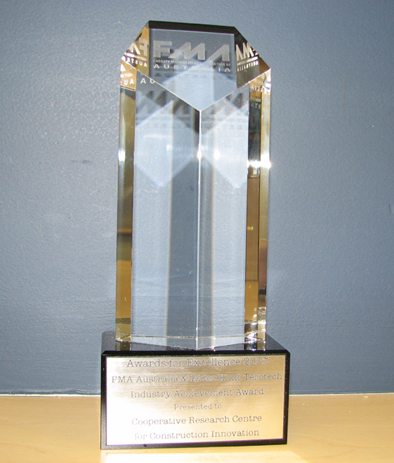 Construction Innovations Sydney Opera House FM Exemplar project has won the Facility Management Association of Australia - Rider Hunt Terotech Industry Achievement Award for facility management strategy and practice, presented at the FMA Australia ideaction 2007 conference in May. FacilityManagement Association of Australia - Rider Hunt Terotech Industry Achievement Award for facility management stragegy and practice. The Sydney Opera House FM Exemplar project was initiated by the Australian Governments Facilities Management Action Agenda, as part of a strategic framework for managing the built environment. The project focused on three main research streams: Building Information Modelling (BIM), services procurement and performance benchmarking. These streams were combined into an integrated FM solution intended to have applications for the broader FM industry. The BIM component of the research project also featured in two recent international awards the Jurys Choice category of the American Institute of Architects (AIA) Technology in Architectural Practice (TAP) 2007 Building Information Model awards, and the Bentley Awards for Excellence 2007 award for BIM in multiple disciplines. A project team of Arup/Utzon Architects and Johnson Pilton Walker (Architects in Collaboration) were successful in winning these international awards, utilising the results of the Sydney Opera House FM Exemplar project. Our research has demonstrated that a digital model of a section of the Sydney Opera House which provides a three-dimensional representation of the building and the relationship of objects such as lifts, ventilation and fire systems within the building, can also integrate FM functions like condition reporting, energy consumption and room bookings, said Mr Peter Scuderi, Acting CEO of the CRC for Construction Innovation. The BIM component of the research was based on use of the IFC open standard to integrate FM data from a range of software systems into a partial BIM of the Sydney Opera House. The ability to import and share information from various data sources by means of open software standard has the potential to revolutionise the facilities management industry, Mr Scuderi said. The Sydney Opera House FM Exemplar project was undertaken by the Cooperative Research Centre (CRC) for Construction Innovation in collaboration with Rider Hunt, Woods Bagot, Transfield Services Australia, Sydney Opera House, FMA Australia, Brisbane City Council, Queensland Department of Public Works, CSIRO, Queensland University of Technology andThe University of Sydney. The project was led by Stephen Ballesty, Director of Rider Hunt and Immediate Past Chairman of FMA Australia. Sydney Opera House Australias most famous landmark and one of the busiest performing arts centres in the world has taken centre stage in producing world class research for the Facilities Management (FM) industry. The Opera House was showcased as a template for innovative FM practices in a major Department of Industry, Tourism and Resources and Cooperative Research Centre (CRC) for Construction Innovation research project the Sydney Opera House FM Exemplar Project. Australias FM industry employs more than 170,000 people and generates approximately $12 billion of Australias gross domestic product. The Hon Bob Baldwin MP, Parliamentary Secretary to the Minister for Industry, Tourism and Resources, said the Sydney Opera House FM Exemplar Project not only helped protect Australias most iconic building but also contributed to the body of FM industry knowledge.